Something I really, truly love is the phenomenon of how recipes evolve over time. What makes a recipe change? I suppose a number of things play into it: modern tastes, ingredient availability, time constraints, technological advances. 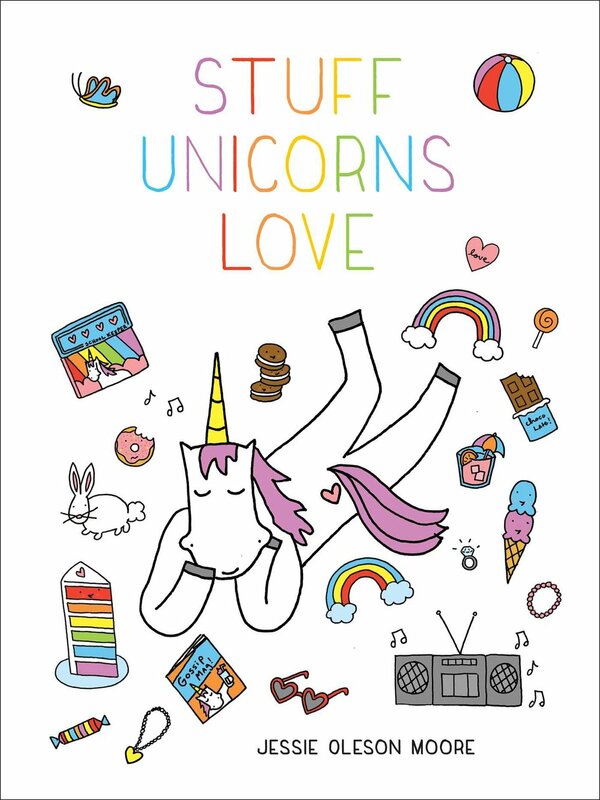 Sometimes all of these things. Sometimes just one. I bring this up because it's a very roundabout path that led me to sharing this cake recipe with you. What happened first, many years ago, before I was a professional CakeSpy, was that a little boy brought Congo Bars (made by his mother perhaps) to a class event. 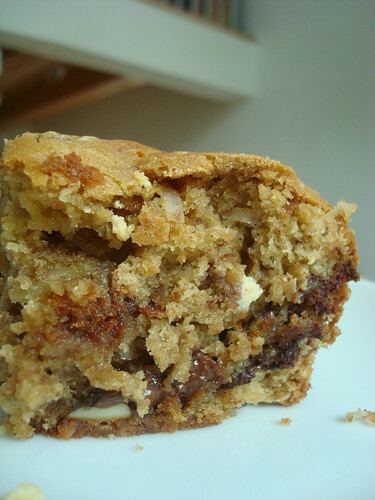 A little girl who may have already taken a shine to the boy for SURE took a shine to these bars, and kept the recipe. When she went to college, she began baking, but the recipe changed because of her limited equipment and ingredients. One notable change, for the better, she thought, was swapping out vanilla for kahlua or Baileys or liqueur. It didn't hurt anything, she realized. I'm not this girl, but I met her recently. She brought these Congo Bars to my book signing in Collegeville, PA, and was kind enough to share the recipe with me. But then, the other day, when I pulled out the recipe, I realized there were several alterations I'd have to make. For one thing, the recipe didn't include how many eggs went into it, so I took a guess and decided on three, because I have a blondie recipe that has that many eggs. Why not? Second, I realized that I only had one stick of butter; the recipe called for two. So I wondered...what would happen if I used half butter and half cream? Third, I decided that since I was messing with the formula anyhow, why not try making them more in the method of the Katharine Hepburn brownies from my book? So, I messed with the recipe again in that way. 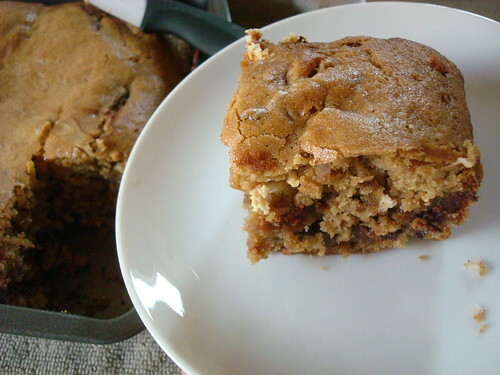 The resulting recipe differed quite a bit from the delicious Congo Bars that were brought to the event, so I am going to save that recipe and share it with you another time. But I can say that while my result was very different, it was still pretty darned good. 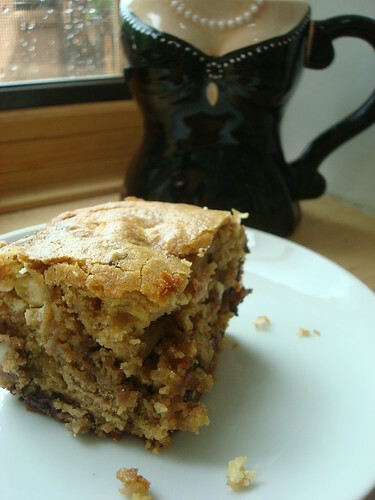 So here's the recipe as I made it, which I'll dub Brown Sugar Congo Cake. 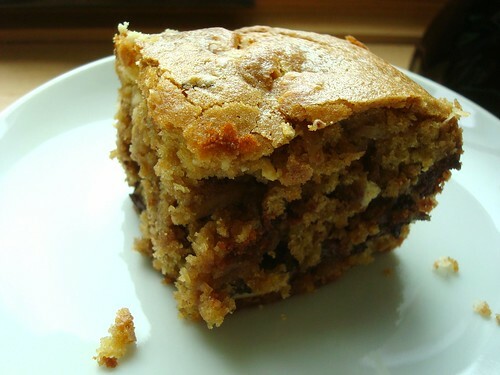 This light and fluffy cake is nicely chewy in the areas that have chocolate or gooey fillings, and it actually seems appropriate as a morning cake. 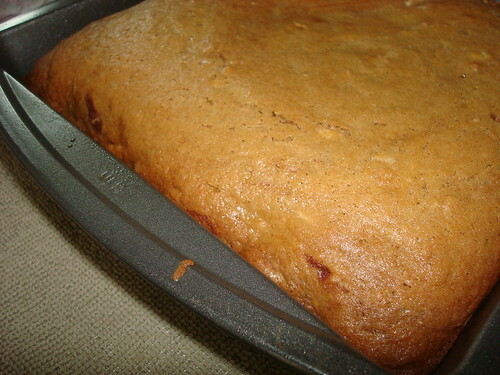 I found it was especially lovely when topped with cream cheese or almond butter. 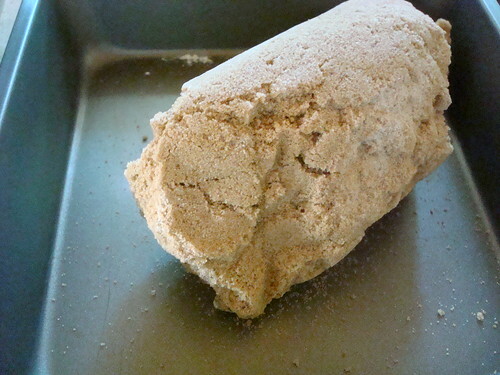 I should also tell you that the brown sugar I used was hard as a rock. But it wasn't a worry! All I did before making the recipe was heat the oven to 300, and then place the rock of brown sugar on a large plate and into the oven. After a few minutes the heat made it soften enough that I could break it up. Keep in mind, though, that this method must only be used pretty directly before baking, as the sugar will re-harden after an hour or so if not used. 2 tbsp. Coffee Liqueur or any liqueur that strikes your fancy. Preheat your oven to 345 degrees (yep-- not 350). Sift together the dry ingredients; set to the side. Grease (with BUTTER) an 8x8-inch pan very well, especially the corners. 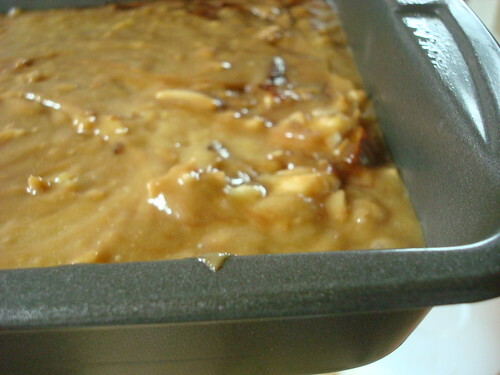 In a large saucepan over medium-low, melt together the butter and cream, until the butter has completely disappeared. Add the brown sugar, stirring until completely dissolved into the mixture. Remove from heat. 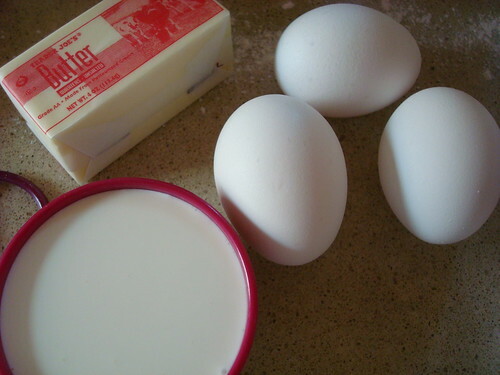 Add eggs, and mix until smooth. 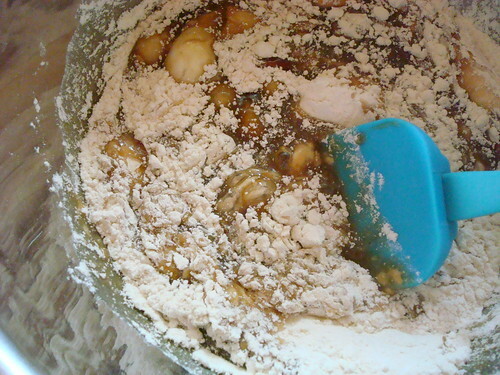 Add the dry ingredients in 3 batches. 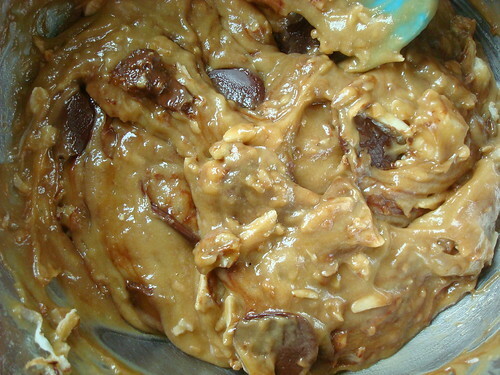 Mix in chocolate chips and any other stuff you want to add. 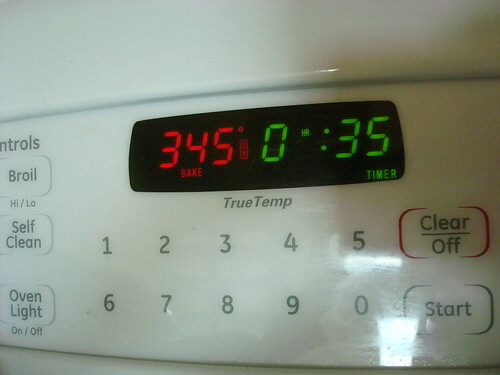 Bake in your preheated oven for 30-35 minutes, or until golden on top and a cake tester comes out mostly clean. Remove from oven. Let them cool, and serve! Great in the morning with cream cheese or almond or peanut butter; great at night with ice cream.